Over 100 years after the idea of building a ring railway in Moscow was first proposed, the new rail system has finally become a reality. The Russian capital’s new transport network, the Moscow Central Ring, will reduce commuter loads on rail hubs and metro stations around the city. Moscow is set to take a large step forward in its unending struggle to keep pace with the growing demand for public transport infrastructure as the city continues to expand. A new light overland railway system will allow commuters to change to city transport networks without travelling into the Moscow city centre. 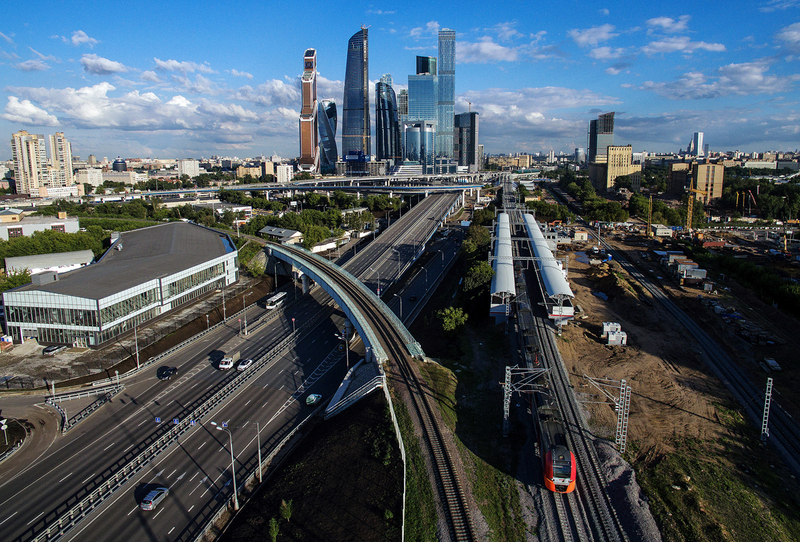 The Moscow Central Ring (MTsK), an equivalent of Germany’s S-Bahn and the London Overground, was inaugurated in the Russian capital on September 10. New carriages, equipped with free Wi-Fi, will transport up to 400,000 passengers daily, thus reducing the load on the Moscow subway network – the Moscow metro – by 15 percent, and cut the average journey time by 20 minutes. "We need to break in this system, see how convenient it is for passengers, what problems there are. It’s an enormous infrastructure. We hope it will occupy a worthy place [in the city’s transport network], if not immediately, then in a couple of years,” said Sergey Sobyanin, the mayor of Moscow, in an interview with TV channel NTV. The MTsK will use Lastochka carriages made by the Siemens corporation specially for Russian Railways. They were used during the Sochi Olympics and are currently used for commuter services from Moscow’s Leningradsky and several other stations. The MTsK will use 130 pairs of the cars daily. Lastochka carriages are bigger than those used in the Moscow metro. They are wider and have fewer seats. They also have toilets, climate control, screen monitors, and additional space for prams and bicycles, as well as Wi-Fi and power points for gadget chargers. Each train will have five such carriages and will be able to accommodate 1,250 passengers. The MTsK will use the same tickets as the Moscow Metro and other means of public transport in the city, including the Troika travel card, though Sobyanin announced (in Russian) on his Twitter account on August 30 that travel on the new network would be free for the first month after its launch. What should Moscow residents expect? The Moscow Central Ring will consist of 31 transit hubs, each of which will be linked to public transport stops and 17 to stations on the Moscow metro. Eleven of these stops will have covered galleries to change to Metro lines: Engineers call this the “dry feet” principle. Ten MTsK stops will be connected to commuter train services. The city authorities promise that an average change between stops will take not more than eight minutes. Trains will run at intervals of five-six minutes at peak times and 10-15 minutes the rest of the day. MTsK working hours will be the same as the Moscow Metro: from 6:00 a.m. until 1 a.m. The MTsK is expected to ease the load on the circle line of the Moscow metro by 15 percent and on Moscow railway terminals by 40 percent, since commuters will no longer have to reach them to change for the metro, as they will now be able to use the MTsK instead. The designers of the project estimate that with the MTsK, the average journey in greater Moscow will become 20 minutes shorter. For several million Muscovites, the MTsK will become their nearest public transport stop. By the end of this year, it is estimated that Moscow commuter trains will be able to carry up to 400,000 passengers a day. The MTsK is expected to have an annual passenger flow of up to 300 million people. The idea of building a ring railway in the city is not new. It was first broached by the Russian imperial finance minister, Sergei Witte, more than 100 years ago. Tsar Nicholas II ordered the building of a Small Ring Railway on November 7, 1897. Construction work on the project began in 1903. Roof tiles for its Art Nouveau station pavilions were brought from Warsaw and clocks purchased from the renowned Swiss maker Paul Buhre. The stations had electricity and were fitted with stoves. However, contrary to expectations, the railway was not an instant success. High ticket prices put many passengers off. The pricing policy was revised and, up till 1917, the Small Ring Railway served the needs of numerous Moscow workers and civil servants. After the 1920s, however, when districts covered by the ring railway were connected to tram and bus services, the railway was no longer used for public transport, and served only to transport cargo. During the Soviet era, there was much talk of reviving the MTsK as a means of public transport. However, its usage to transport cargo and some of its construction features did not make it possible to easily and quickly convert the line to carry passengers. It was only in 2011 that the city authorities approved the integration of the ring railway into the Moscow public transport system. Once the project is fully implemented, the MTsK will be like an equivalent of the London Overground, Germany’s S-bahn, Austria’s Stadtbahn, France’s RER, Italy’s Passante, and Hungary’s HEV.